Prose for Thought | Phil – Refuelled! For ‘Prose for Thought’ this week, hosted by Vicky at Verily, Victoria Vocalises, I am introducing my story entitled By the Butterfly Tree which is appearing on this blog in small instalments. I would like to explain how this story came into being, and thank those people who have motivated me. You see, I should say first that, at school – all those years ago – there were some subjects I enjoyed and got quite good at. Science, and stuff. Maths. Now, when it came to English, I was a mixture; comprehension and descriptive writing I could handle, the odd poem, even. But writing fiction was a nightmare for me; as Winnie-the-Pooh would say, it didn’t. It just didn’t. So, when I get complimentary comments on here, about my writing, I feel both honoured and humbled – in a good way. Well now, first came ‘The Twitter Key Project’ conceived, organised and hosted by Josie aka @porridgebrain on Twitter, which she explained here. Along with many others, I submitted an entry, which Josie kindly wrote on a label and added to the project here, with a photo. 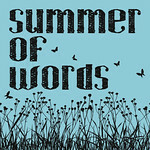 And then, more recently, Helen, who blogs at All at Sea, came up with a concept she called ‘Summer Of Words’ which she explained here. She personally invited me to take part. The story in many parts, now unfolding on this blog, is the result. Many thanks to Josie, Julia, and Helen. And to all of you who may care to read By the Butterfly Tree. For Prose for Thought this week, hosted again at Verily, Victoria Vocalises, I’m publishing a little ‘word picture’ that I put together a good while ago, and which is (if the person who recounted the incident to me, an even longer time ago, is to be believed) founded on fact. All I’ve done is to add a little colour and atmosphere, for which, as they say, I haven’t charged you any extra. Somewhere near the centre of a Midlands city, at around 11 pm. on a Friday, a police patrol car has stopped behind a small and rather battered-looking white van. The car’s blue beacon is still flashing. The officer has walked from his car to the driver’s door of the van, and opened it. The ‘motorist’ has fallen out, his head and body on the road, his feet still tangled in the pedals. A miasma of beer-laden breath pervades the immediate vicinity. This is the moment. The officer’s mien is static, his face inscrutable. The erstwhile driver of the van is motionless simply because he is helpless. The rotating beacon is the only visible sign of any movement, indifferent to the frozen charade over which its blue beam traverses. 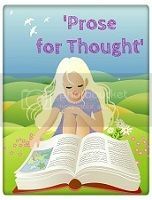 Today, Prose For Thought, hosted by Victoria Welton at Verily, Victoria Vocalises opens for new entries once again. Oh, and today’s other event is that it’s World Poetry Day. So today – or, I should say, tonight – I’m going to post, er, well, a poem. It’s one that I’ve blogged before, albeit in a slightly different context, but I’m doing so again, for two reasons; firstly [holds hands up] I haven’t got another one ready just yet, and secondly, the motivation behind this poem has increased since I wrote it, around two years ago. This is because I have come to know so many more people, through the blogging community, who have come through – or, indeed, are still going through – severe trials, of some kind, in their lives. In a vista – in a touch – to those who have awoken. Has eyes to give a smile – not just for seeing. Into that inner space her love she dares to send. She calls to tell you what is truly ‘morning’. More than another ship called Duty making dock. A clear horizon melts from blue to gold. The story of today is waiting to be told. Nor yet despair of finding answers yet unknown.